So it goes...: White, Just White. We got about 14" last night during the blizzard of 2011. Racine was hit the worst and got 23". The biggest issue was the wind, as it often is during snowstorms. It caused some freaky drifting around the house and city. It made for some interesting snow blowing, where at times, the entire blower was under snow. You just had to kind of let it chew away. 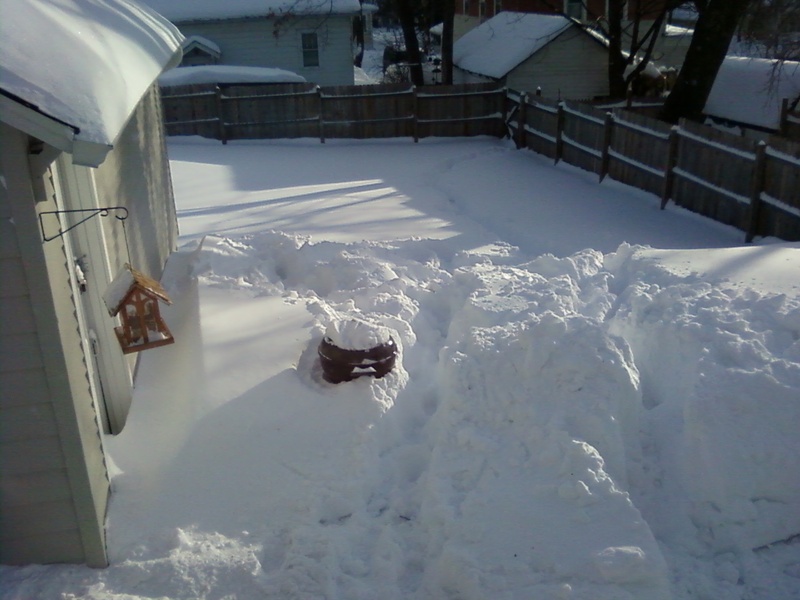 It took me the better part of an hour to clear our drive and walk, which is better than some fared. It's times like these that I like my small yard and small walk. I took poor Toby for a walk in it and he was just kind of shell shocked. Poor boy didn't know what to think. He was fine where there was sidewalk, but at one point when I was blazing a trail, he was following behind in my footsteps for a while, but then he just stopped. I think he was afraid that he would drown in snow. That was the look on his face. "I'm scared papa, hep me, hep me!" I trudged back and picked him up and carried him along until we came to cleared sidewalk again. We had our first "civil emergency" in quite some time around here. It basically amounts to the government telling people to stay home and that if you're dumb enough to go out and get stranded, we may not be able to get the emergency vehicles to you. So stay home. You don't have to tell me twice, man. I love being home. Ha! Once the roadways were cleared, we did take Sarah over to a friends' house, while Ben had a friend over here. It was a lazy day outside of the shoveling and snow blowing. I said that I wouldn't mind work near so much if I had every Wednesday off. It's like a mini-weekend in the middle of the week. Day 9 of the flu and I still feel like crap. My eyes feel arthritic, if that's possible, and I don't think it is. Still have one working nostril and a stuffy head. Oh yeah and the occasional coughing fit. Throw on top of this the ongoing pulsatile tinnitus and there's just a party in my head that won't stop. Come on in! Just got off support with Dell support (aka. someone in India). My laptop was going dark on me in the middle of working and then would drop into hibernation mode. I think it was because I had overheated it by using it without proper ventilation. The guy(?) Dell Tech (Saurabah) took control of my laptop and flashed the BIOS. I could have done it if he had told me that's what was wrong, but he was doing such a nice job using "Go to Assist" that I didn't want to interrupt. Anyways, he said to "monitor" it for a day and he would call tomorrow. I think as I said, that I just overheated the thing. I'll keep the vents clear and see how it goes. So the winter that wouldn't end just keeps boring ahead. Tomorrow we have below zero temps again, Woo Hoo! At least it's February the Packers are in the Super Bowl. (Still cannot believe that!!!). Here's to God's small mercies.